This is the bioregion of tall trees. Many of the world’s largest examples of conifer species are found here in the Klamath region’s cool wet cathedral forests. Trees in the Klamath bioregion include old-growth redwoods, white fir, Douglas fir, ponderosa pine, Sierra lodgepole pine, incense cedar, sugar pine, red pine, Jeffrey pine, mountain hemlock, knobcone pine, western red cedar, red alder, tanoak and Pacific madrone. Rare plants: Humboldt Bay owl’s clover, Calistoga ceanothus, Baker’s navarretia, coast lily, swamp harebell, Tracy’s sanicle, Snow Mountain willowherb, pale yellow stonecrop, Scott Mountain phacelia, Klamath Mountain buckwheat, Oregon fireweed, dimorphic snapdragon, Colusa layia, and Stebbins’ lewisia. Endangered plants: Sebastopol meadowfoam, Burke’s goldfields, marsh checkerbloom, McDonald’s rock cress, Adobe lily, Indian Valley brodiaea. The coast of the Klamath bioregion is cool and has the wettest climate in California. It is moist and often foggy. The lower elevations experience rainy winters, while the higher mountains get snow during those same months. Inland, the climate is warmer and drier. This area has low rainfall in winter and hot, dry summers. Much of this mountainous bioregion is covered by lush forest, including the Klamath, Shasta-Trinity, Six Rivers, and Mendocino National Forests, Jackson Demonstration State Forest, Humboldt Redwoods State Park, and Headwaters redwood forest and preserve in Humboldt County. The Klamath bioregion includes the Lost Coast area, the North Coast Range and the Klamath, Siskiyou, Marble, Salmon, Trinity, and part of the Cascade Mountains. 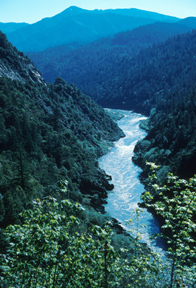 Major rivers include the Eel, Trinity, Klamath, Russian, Smith, Salmon, Scott, Mad, and Mattole. Largest lakes are Clear Lake, Whiskeytown Lake, Clair Engle, and the western part of Lake Shasta. The wetlands of this bioregion provide habitat for native and migrating birds and waterfowl, including the endangered Aleutian Canada goose. Examples of other wildlife in the bioregion are osprey, western sandpiper, mule deer, mountain lion, and Karok Indian snail. Rare species: Goshawk, black bear, Chinook salmon and Pacific fisher (a weasel-like mammal). Threatened and endangered species: Oregon silverspot butterfly, lotis blue butterfly, Trinity bristle snail, red-legged frog, Siskiyou Mountains salamander, Marbled murrelet, Aleutian Canada geese, California clapper rail, Swainson’s hawk, American peregrine falcon, bank swallow, Northern spotted owl, willow flycatcher, bald eagle, Point Arena mountain beaver and wolverine. Logging– The Klamath bioregion is home to some of the last ancient redwoods on Earth. 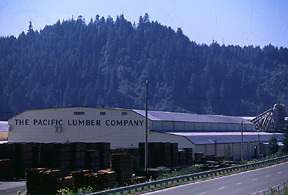 Although the old-growth trees in the area’s parks and preserves are protected, many others are on privately owned industrial timberlands still being logged by companies such as Pacific Lumber. Logging causes siltation, which buries the gravel beds that steelhead trout, Coho salmon and other anadromous fishes use for spawning. In addition, logging can destabilize slopes and cause mudslides such as the one that destroyed several homes in Stafford, Calif., in 1999. Fisheries– Water from the Klamath and Trinity rivers has been siphoned off for irrigation, mostly of thirsty cash crops in the area such as hay. The resulting low water levels have killed tens of thousands of salmon in recent years. 2014 ©Forests Forever. All Rights Reserved.